Please be aware of what to wear in Bagan, there IS a dress code and it is conservative. You should be spending the day looking at temples and pagodas, dress appropriately! Don’t be the douchbag in daisy dukes and a spaghetti top. Knees and shoulders need to be covered. Yes yes it’s so hot there I hear you moan, well tough, man up and show some respect. Girls, you can wear whatever you want when travelling around town, but when you get to the religious sites you do need to cover up. Take a light scarf or t-shirt with you that you can take on and off to cover your shoulders. Flipflops is the best idea for footwear as you’ll have to take them on and off quite a bit if you plan on entering some temples. 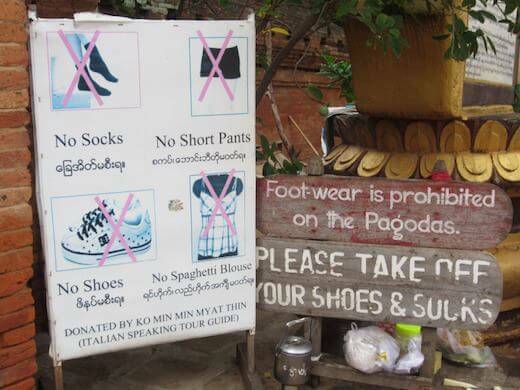 It’s very important to know what to wear when visiting Bagan, the temples and pagodas here are sacred to the people living around them and wearing the wrong thing is as good as spitting at them. Talking of disrespecting the place, these camera knobs who climb all over the temple or pagoda for the best viewpoint not caring that they are in-fact tearing down the thousand year old walls in the process drove a lot of us regular ‘lets just enjoy watching a nice sunrise’ people a bit mad. They have special gloves, lenses longer than my arm and rarely even sit back and look at and enjoy what they are taking a photo of, just click click click. Slow down camera knobs, come out from behind the lens and take a look in real life, enjoy the moment, it’s spectacular. Nothing beats the feeling of seeing the sunrise over a hundred pagodas while hot air balloons slowly drift past, its dream like and sure makes a good photo, but don’t let that consume you. Bagan is a place for feelings and emotions, where a story and a warm memory can be as worthy as a photo to look back on. Don’t get me started on the iPad photographers. Placing their huge screen so nobody else can see a thing, you’re ruining it for everybody, just stop!